Everyone loves discovering new places to find and explore in Manchester, right?! We asked around at the Breakout HQ to gather intel, and together have compiled a list of recommended new places to visit. Follow our guide to guarantee that you’ll have the perfect day out in the UK’s best city (in our opinion, anyway!). Why not kick-start your day by enjoying one of Moose Coffee’s American-Diner influenced breakfasts? Or, if you’re a late starter, be sure to try their brunch experience, which includes their very own Moose blend espresso coffee. After you’ve devoured your American-influenced breakfast, head down to Breakout Manchester for the ultimate gaming experience. Get locked in a room for 60 minutes and solve a combination of clues, riddles and general brain bogglers in a bid to ‘breakout’. All you have to do is find yourself the perfect team of 2-5 people and decide on a room you wish to play. With two locations in Manchester, one opposite the Town Hall and one on High Street, we can accommodate 60 people per hour across both sites. With 12 rooms in total, we have a wide variety of rooms, from ‘The Detective Office’, in which you’re involved in solving a murder, to escaping a murderer in ‘Captured’. The rooms range in difficulty, starting from 2 stars, but, if you’re up for a challenge, working their way up to a very challenging 5 stars. If your day revolves around food, don’t fear – we’ve got it covered! If you want anything at all, ranging from sandwiches to pies, be sure to visit Abel Heywood. Located in the Northern Quarter, Abel Heywood are a unique pub and boutique hotel. Boasting a classic Victorian feel, this unique pub is jam-packed with character and offers a wide variety of food and cocktails. If you fancy something different, they hold bi-weekly quiz nights (hosted by Quizzly Bears), with guaranteed fun trivia themes such as Harry Potter or Mean Girls. If you’re more of a hotdog and pizza fanatic,Dog and Dough is the place for you. With their unique hotdogs and pizzas, there is guaranteed to be something for everyone. 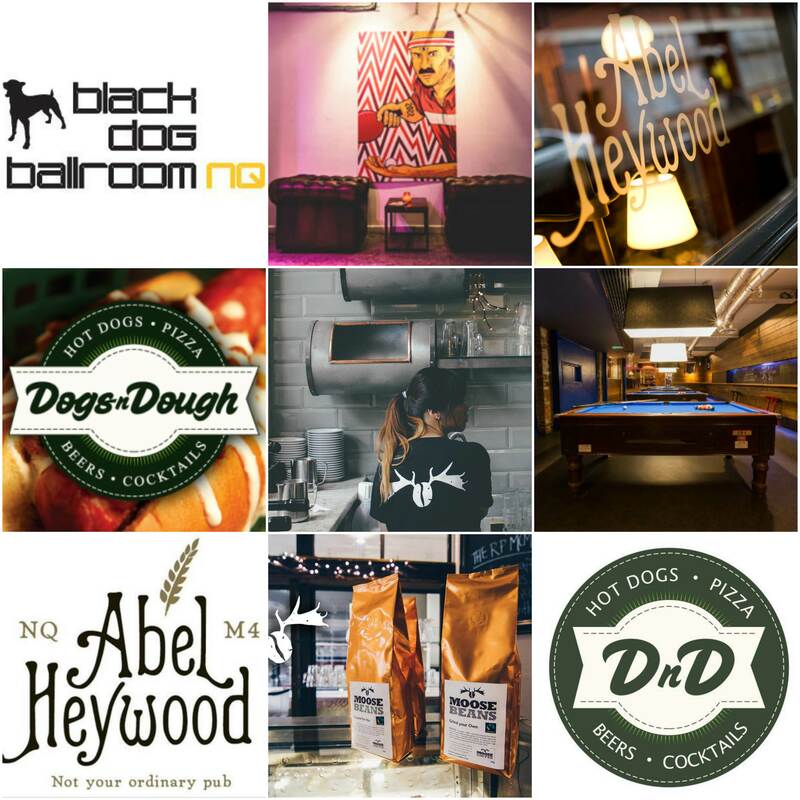 Dog and Dough is located near the Albert Square, and just underneath lies an 80s-themed arcade, pool and cocktail bar. If you’re stuck for ideas after devouring your hot dog, be sure to venture down here for cocktails, games and general fun. Once the night-time arrives and you’re craving drinks after a busy day of solving puzzles and indulging, head towards the Black Dog Ballroom. Whether you’re celebrating or drowning your sorrows, be sure to sample one of their boozy shakes - if you plan your time wisely, you might even be there for one of their many events! Black Dog Ballroom offer quiz nights, or, if you prefer live music and DJ sets, The Bunker is a brand new dance and live space, so you can dance the night away! To end the day, venture down to Twenty Twenty Two. This is a unique bar and ping pong room located in the Northern Quarter, and is open 7 days a week. Twenty Twenty Two boasts 4 Ping Pong tables, DJs at weekends, and even has an event space available for hire. On certain days they hold special events, for example, on Mondays they have free ping pong and on Thursdays you can challenge the bartenders to a game. If you’re successful in beating the bartenders, you can double your round of drinks! They are open until 4am on Fridays and Saturdays, so you can play ping pong to your heart’s content (or until you’re ready for bed…). Manchester is without a doubt the best city in the country (no debate about it) - there is literally something for everybody! It has food, fun and enough escape games to keep your friends and family busy for weeks on end. So whether you’re coming from Bury or Beijing, be sure to visit Breakout Manchester – we’ll be waiting and ready to lock you up!